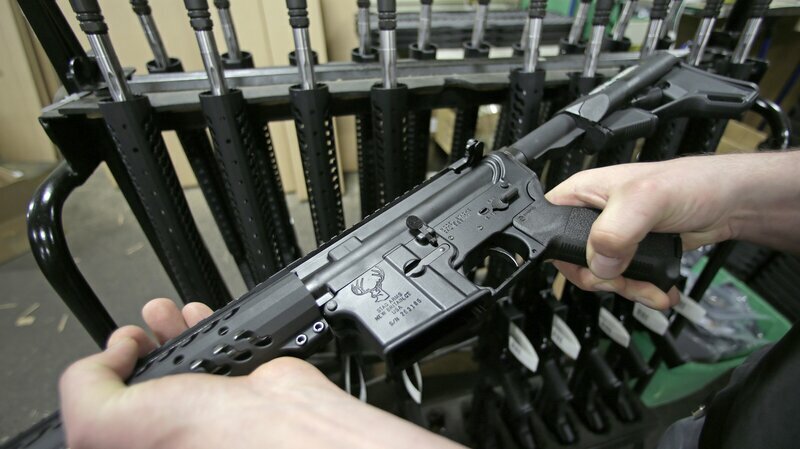 The U.S. Supreme Court has rejected an appeal from gun owners who challenged a ban on semi-automatic assault rifles and large-capacity ammunition magazines. Two justices — Clarence Thomas and Antonin Scalia — would have heard the case and struck down the ban. In deciding not to revisit the issue in the Highland Park case, the justices followed a pattern. Since declaring an individual right to bear arms, the court has largely stayed out of the gun control question altogether, refusing the pleas of gun rights advocates, in addition to many states that have urged the court to rule again and expand the right to gun ownership. Monday&apos;s action leaves in place a decision issued by the Seventh Circuit Court of Appeals upholding a local ordinance enacted in the Chicago suburb of Highland Park. In 2013 the town enacted a statute banning the possession of what it called assault weapons, including AR-15s, and AK-47s, and it banned large capacity magazines that can accept more than 10 rounds. Gun rights advocates promptly challenged the ban, contending that it violated the Second Amendment&apos;s guarantee of a right to bear arms. In 2008 the Supreme Court ruled for the first time that the Second Amendment protects the right to own a gun for self defense in the home. But the 5-4 decision appeared to leave government at all levels wide latitude to regulate gun ownership and possession. Since then, many state and local governments have enacted new and stricter gun laws in the face of mass shootings at Sandy Hook Elementary School in Connecticut, in Aurora, Colo., and elsewhere. And at the same time, gun rights advocates have challenged these and other gun control laws, claiming these statutes are unconstitutional. In the Highland Park case, the justices debated for months whether to review the lower court decision upholding the law. The fact that it took so long suggests either that Justices Thomas and Scalia were trying to persuade some of their colleagues to hear the case, and failed, or that neither side of the closely divided court was sure it had to votes to prevail. Justice Thomas, writing for himself and Justice Scalia in dissent, said that there is nothing unusual about the guns banned by the Highland Park ordinance; calling them assault weapons, he said, is nothing more than "anti-gun propaganda." Allowing this and other similar laws to stand, he said, "flouts" the court&apos;s previous rulings on the Second Amendment right to bear arms.